TV SoundConnect lets you connect your Samsung TV and audio product wirelessly via a Bluetooth connection. Select the 'Source' icon of the Multiroom App and choose the 'TV SoundConnect.' Set 'Add New Device' to 'On' in the TV's settings menu and allow the device to pair using Bluetooth. 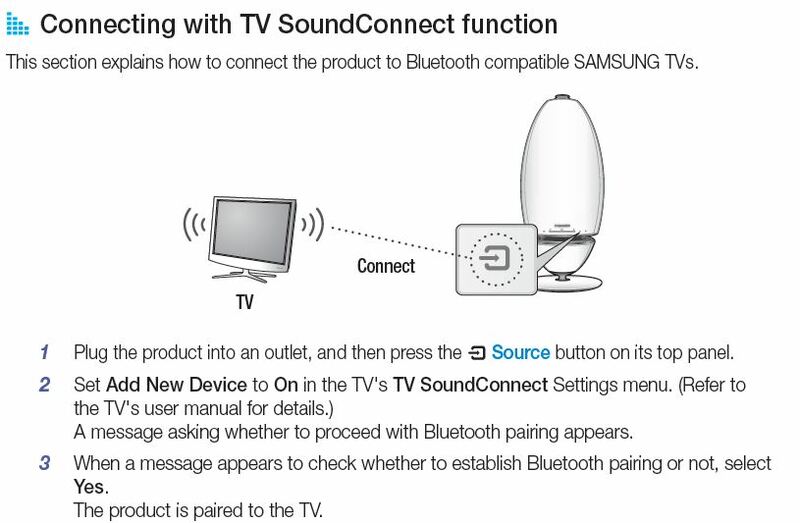 Please note that TV SoundConnect is only supported by selected Samsung TV models released after 2012. Wireless Audio 360: How do I connect my Samsung Wireless Audio 360 to a bluetooth device?